How do you know what are the best cat carriers? There is an amazing array of cat carriers available at your local pet store and online. How do you select the right one? Don’t bother asking your cat. He will simply tell you there’s no such thing as a GOOD cat carrier. The real answer is a very personal one depending entirely upon you and your beast. Before you can pick the best cat carriers for your feline, there are are some things you should take into consideration. Here is the 411 on best cat carriers. Airplane travel can be especially difficult for your cat. Your cat will be grateful for a secure space. We think this airline-approved cat carrier by Mr. Peanut’s is nearly purr-fect. Not only is it handsome enough for most fashionista cat Moms to strut around the airport with, but it is also made from premium, lightweight materials. It is both sturdy and cozy with a removable (aka cleanable) fleece bedding. It’s suitable for cats under 14 pounds and complies with the under seat compatibility specifications of all major airlines. This cat carrier will provide the dark, quiet space Kitty needs while she travels, but can still give her a view of your feet if she feels lonely. This cat carrier has multiple ways to access your pet (top and both ends zip open). It also has a handy compartment for treats, toys, or food. It retails under $40.00 and carries a 100 percent satisfaction guarantee. Perhaps the best feature of Mr. Peanut’s cat carrier is that the company was founded with the commitment to PAY A SHELTER PET FORWARD – Mr. Peanut’s donates a percentage of gross profits to animal welfare organizations, pet shelters and rescues of all kinds and in all areas. We recently had the op-paw-tuna-ty to test out the Fat Cat backpack by Your Cat Backpack and loved it! This backpack is great for going on hikes, day trips, and adventures with your cat. You can also use it for traveling in the plane, but we haven’t tested it for that yet (TBD). The Fat Cat is available on Amazon or on the Your Cat Backpack shop. Use our special discount codes “FLUFFYKITTY” to get $10 off your purchase. Or, if you live outside of the U.S., use code “FLUFFYKITTYSHIPPING” and get free shipping on your order. Car travel is most likely the most usual transportation challenge for you and your cat. After searching through dozens of models, we selected this one based on the features and the overall reviews from pet parents. 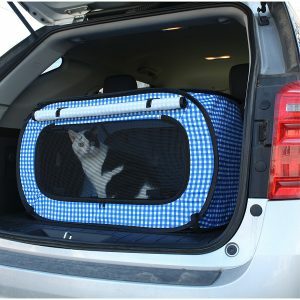 Even though this carrier does not have handles for carrying, it is ideal for road trips or even quick visits to the vet. It is not suitable for airline trips. We were especially happy to learn that the manufacturer has improved the carrier to include a seat belt strap to keep the carrier tethered to the seat in the event of an accident. Seat belts are very important. If people should buckle up, so should their lightweight and more portable pets. This is one of the best cat car carriers. If you ever need to move from one house to another or need to leave home in a hurry because of an impending disaster such as a hurricane or wildfire evacuation, this kitty condo is essential. In it, kitty can feel safe and secure. She will also have plenty of room for her food, water, and potty box, giving her some security in what might be an insecure situation. If you plan to make an initial investment in a carrier that will suffice in most situations, we recommend an expandable cat carrier. Not only can you give your cat more room when she is under the row of airline seats in front of you, but you can also expand the carrier if you’re traveling by car to give your feline extra space. Petsfit collapsible cat carrier is a great fit for pet parents looking to get a great value-for-money deal. It is expandable and also airline approved! Included is a washable fleece bedding, plus a bonus blanket and bowl. This carrier is constructed from high quality, lightweight materials with upgraded durable zippers, and stronger straps and seams. A superb steal! Why Do We Need Cat Carriers? Even the mellowest cat should be transported in a space of its own for safety and security. Unless your cat has been riding in the car from kitten-hood, traveling can be unsettling for most felines. The world seems to be hurtling past her for no good reason. The car, to a cat, sounds funny, smells weird, and is generally a disturbing place. A plane or a bus is nothing more than a car on steroids to the average cat. Transporting your beast can be very traumatic and stressful. Even a quick trip to the vet’s office is unsettling to your cat. What’s worse, if this isn’t Kitty’s first trip to the vet, she is probably expecting the worst. To your cat, a trip in the car heralds undignified poking, prodding, and temperature-taking. That’s enough to make any cat bolt. Even if your cat is a pro at walking on a leash, it’s best to take a cat carrier with you. Securing your cat in an appropriate carrier will also help to protect you and everyone else on the road. If you’ve ever tried to capture and subdue a terrified feline you know how they can slip through your fingers. They can get under the car’s seat, behind the car’s pedals, and entangle themselves in your steering wheel. This is not something they prepare you for in Driver’s Training. The best cat carriers provide a safe, dark place for kitty to hide during the nightmare of travel. If you’re taking an extended trip, talk to your vet about ways to make kitty more comfortable. A ‘tunnel’ is the ideal place for kitty to disappear. The best cat carriers help to provide that sense of security. It should also offer more than one door – that way you can extract her from the carrier if she’s reluctant to emerge on her own. As you shop look for a cat carrier that will allow your cat to stand, sit, turn around and lie down comfortably. Pick a cat carrier that is one and one-half times larger than your kitty. When you’re shopping for a kitten, imagine her fully grown, then choose accordingly. If the carrier is meant for a quick trip across town it can be one of the many common cat-sized carriers. On the other hand, if you’re driving to South America, it’s a good idea to invest in a larger model. Something that can accommodate not just her bed but also her food and water dish would be ideal. One of the hard plastic carriers would be a great choice, for example. This brings us to another delicate matter. If your family includes a dog or a second feline, it’s probably the best idea to buy each fur-friend their own carrier. Sharing a carrier can lead to unhappy confrontations even between best buddies in the tension traveling can create. Once a cat has had an ugly experience in a carrier, getting her back into it may be difficult. You can find cat carriers made from plastic, cardboard, nylon, and other fabrics. It’s very important that the cat carrier is easy to clean, leaving no trace of previous accidents. Not only is upkeep and maintenance important, but choose a cat carrier whose material is sturdy and reliable. Remember to line the bottom of the carrier with a soft, absorbent towel just in case of accidents, and also to provide a slip-proof surface. The security of not sliding from side to side as the car moves will also help prevent car sickness. Better yet – choose one with a nice, cushy floor covering that can be laundered. If you will be flying with your cat, make sure your choice of carrier is airline approved. Cat carriers on the market today come in all sizes and shapes. 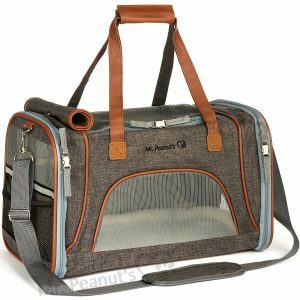 You can choose a mesh cat carrier that looks like a ladies’ handbag (if you have a small kitten) for domestic flights. But most flights will require carriers that give your cat plenty of space (think 3 inches longer and taller than the size of your cat). If you fly with your cat, make sure to invest in a quality carrier, especially for international flights, in which case the carrier will have to go under the plane. A quick Google search for cat carriers will net you page after page of interesting and innovative cat carriers. How do you actually pick just one? You may find that there is no single perfect cat carrier. Instead, you may discover, as we did, that there are affordable cat carriers suited for each of several kinds of adventures. 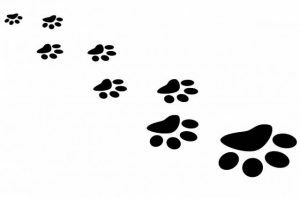 The safety and comfort of your pet is the key consideration when it comes to this investment. We were astonished at the number of pet carriers that were totally unsuited to the safe transportation of your cat. As you contemplate this purr-chase, remember that part of the reasoning of actually buying a cat carrier is to keep your pet safe while in unfamiliar places and situation. Don’t buy a cat carrier because you look cool carrying it. Buy one that will keep Kitty safe. These useful cat carriers come in a wide variety of colors, shapes, sizes, and materials. Only you can choose the one that’s best for your kitty. Do you want a cat carrier with wheels? You can buy it. Do you want a carrier to match Kitty’s green eyes? No problem. Unfortunately, even the best cat carriers don’t come equipped with a soundproofing device. Kitty may still shout over and over again to anybody who’ll listen, “Let Me-Owt!” Sorry about that.. 😉 Not our Yoda, luckily! Next Post My Cat Has Diarrhea but Seems Fine: What Should I Do?